As a landlord, it is reasonable for you to expect your tenants to take care of any garden that comes with your property. But there are certain plants they may have little control over. Non-native, invasive species, like Japanese knotweed, pose a risk for various reasons. And it’s down to you as a landlord to do whatever you can to minimise that risk. Being able to identify offending plants is vital so that you know how they need to be controlled. A fine of up to £5,000 or two years’ imprisonment can result if contaminated soil or plant material from any waste you transfer to spread into the wild. It is crucial you know how to identify these harmful weeds, so be sure to visit this Government resource. You must select the most relevant control method, and seek permission before you use some control methods. You must NEVER plant them in the wild. You must never plant in the wild, or cause certain invasive and non-native plants to grow in the wild. Your responsibilities include avoiding the movement of contaminated soil or plant cuttings. A fine or two years’ imprisonment could result. If you have any of these plants on your land, you do not need to remove or control them. However, you could be prosecuted or served with a community protection notice for causing a nuisance if you allow Japanese knotweed to grow into a neighbouring property. It is not against the law to have Japanese knotweed in your garden, but you are responsible for controlling it so that it does not become a neighbourhood problem. You could be prosecuted if the plant has a ‘detrimental effect of a persistent or continuing nature on the quality of life of those in the locality’. If you have a small, isolated clump of knotweed in your garden, you can attempt control yourself. If the plant has become more established and widespread, however, then you will be best advised to call in a professional control company which will dispose of the plant in line with legislation at licensed landfill sites. For Japanese knotweed control measures, see the RHS website. Invasive, non-native plants can be controlled with chemicals; they can be burnt or buried, or disposed of offsite. When treating with chemicals, only approved herbicides must be used. Bear in mind that some plants can take several years to stop germinating, which means regular re-treating is necessary. Certificates, assessments and permission to use chemical treatments may be required and, if burying plants, you will need to check with the Environment Agency that this is allowed. Burning of plant waste does not require a permit if done privately, although it is good practice to check with the local authority to ascertain whether burning is permitted. Always use a professional, qualified plant control expert, because there is a great deal of legislation and regulation involved that has to be complied with, and certain permits will be required. The Environment Agency will assist with all plant waste disposal enquiries. 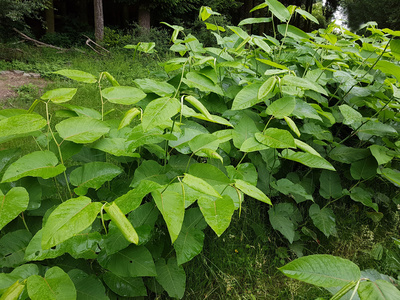 If you have any concerns that Japanese knotweed or other non-native, invasive plant species are not being handled correctly, you can report the issue to Natural England.